ExtremeTerrain has proudly partnered with a program called Building Adventure, benefitting the Philadelphia Outward Bound School and their students. 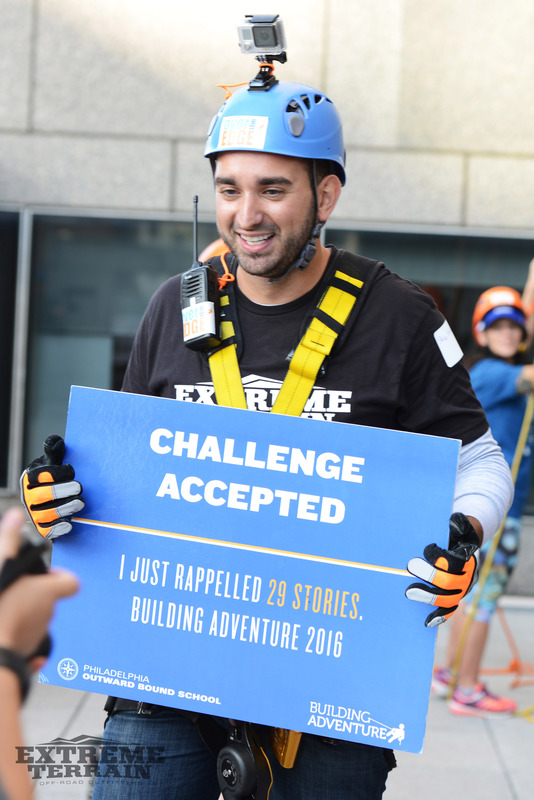 On Friday, October 21st 2016, three ambitious employees were nominated to rappel 29 stories down the Brandywine Realty Trust building in center city Philadelphia along with Turn 5 founders Andrew and Steven Voudouris. Turn 5 team members were asked to nominate one person each who they felt displayed the characteristics of the “Be Ambitious” Core Value, one of Turn 5’s five key values that permeates throughout the business’s culture and it’s employees attitudes. 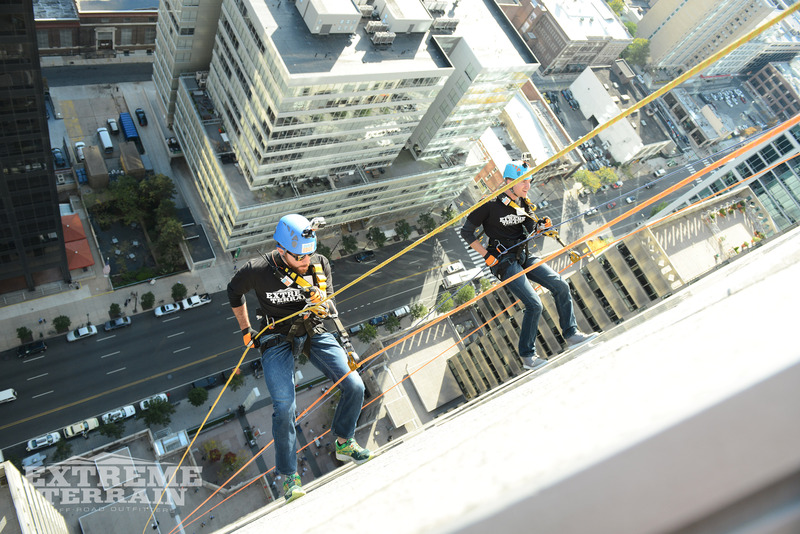 Nervously taking the reigns to their decent, Steve, Andrew, and three ambitious Turn 5 team members–Mike Cunningham, Dan Harmon and Jake Esterly–descended down a skyscraper, raising $15,000 plus matched employee donations for Outward Bound schools. The donations put the school well on their way to funding two complete trips for future student groups. 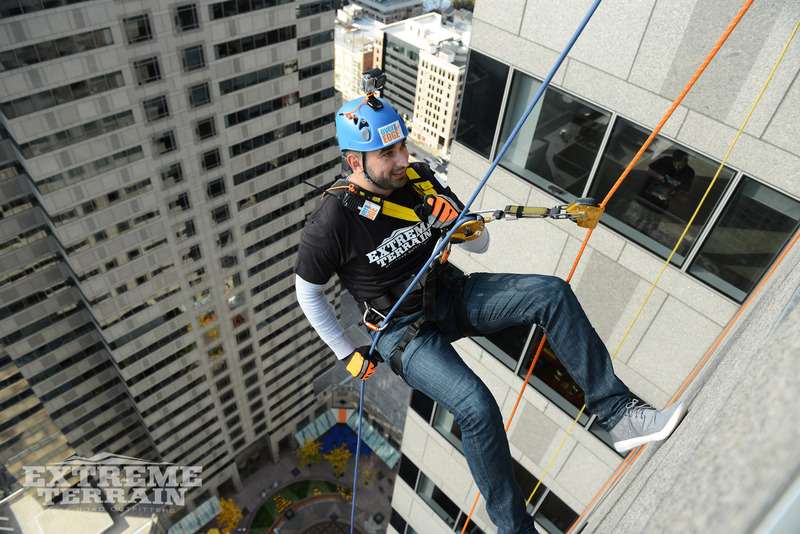 The event invites politicians, business leaders, sports icons, students & teachers each year to rappel from Realty Trust’s Commerce Square Building in Philadelphia. All proceeds benefit the awesome scholarship and life skills adventures of the Philadelphia Outward Bound School. Turn5 employees like BIG things and programs like Building Adventure empower kids to do bigger and better things with their lives by participating! The Outward Bound School believes that children need to take a positive approach to life’s changes in order to succeed. Turn 5’s “Be Ambitious” core value embodies the same ideals for working individuals – you identify opportunities, seize them, and work hard to complete them. We appreciate those characteristics in our employees and wanted them to be part of something as BIG as the projects they take on. Turn 5 puts customer service at the forefront of its mission to cater to each and every aftermarket enthusiast by working tirelessly to deliver the best parts for each customer’s build, every time they place an order. To accomplish such a feat, you need a passionate and motivated workforce of like-minded Mustang, F150, and Wrangler experts answering the phones and recommending the parts that are going to get you to where you want to go next. Those very same people love to wrench on their rides as much as the next gearhead. So why not reward great customer service with a huge Thank You roaring from the dual exhaust on a bright red convertible V8 Mustang? With all customer service reps receiving a compliment from a customer getting the opportunity to win one of AmericanMuscle’s very own project cars, the lucky winner of the AmericanMuscle Project Car Giveaway and a 2005 convertible GT Mustang was Jeff Lebre. 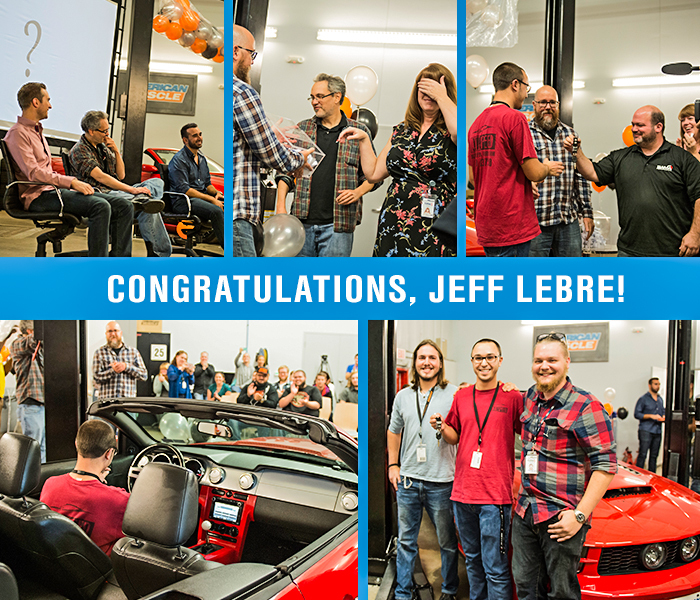 Congratulations Jeff, your help in making other’s dreams come true earned you a shiny new Mustang! 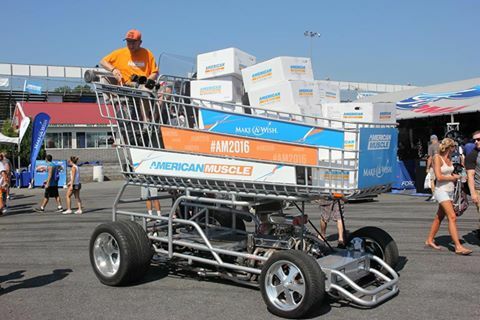 With the support of Turn 5 employees, AmericanMuscle customers, and their families, the 2016 AmericanMuscle Car Show was a complete success, raising $60,200 for the Make-A-Wish foundation. 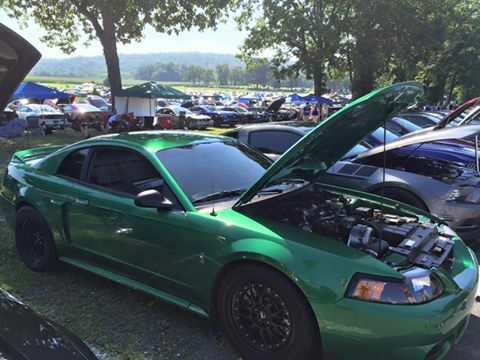 A steamy, sun-soaked August morning at Maple Grove Raceway led into the largest Mustang-only car show in the world–a day that draws nearly 3,000 Ford Mustangs and 10,000+ visitors a year to the scenic, rural Pennsylvania town of Mohnton. The idea behind the event is a simple one–to show AmericanMuscle customers appreciation for their support while collectively endorsing a wonderful cause. 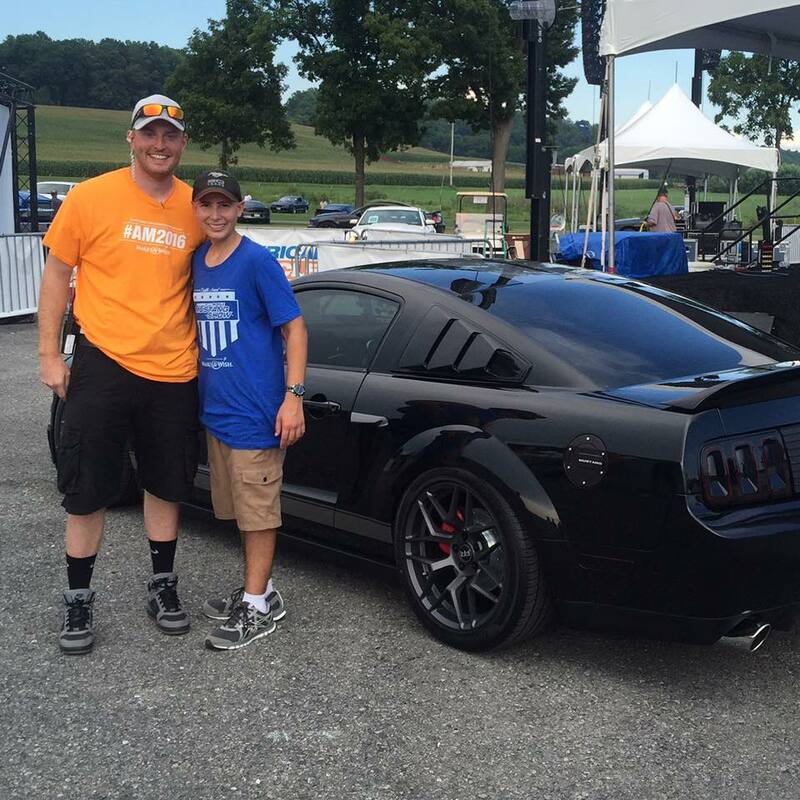 With this year’s totals, in combination with the money raised at the 2015 car show, Turn 5’s AmericanMuscle has proudly raised over $110,000 for the foundation and built two Make-A-Wish recipients their dream Mustangs. The $60,200 from this year’s show will be used to sponsor six additional wishes. A huge “Thank You!” goes out to everyone involved! What’s your most important attribute? Most folks find this question tough to answer, which is how it should be. If you can single out your top trait without giving it any thought, you’re liable to be pigeonholed as a one-dimensional person. Fair or not, one-dimensional people don’t get much respect. Entrepreneurs need to be doubly conscious of their personal strengths and weaknesses. If you can’t sell yourself, you’re going to have a hard time selling your business idea (or your product, when it’s time). This is especially true for younger entrepreneurs, who have more to prove than their wizened counterparts. Setting goals is one thing. Doing whatever it takes to reach them is quite another. Drive is hard to teach. To use an old cliche, you really have to want it more than everyone else. Drive won’t get you far in the absence of long-term vision. The reverse is also true; without an innate drive to reach your goals, it’s hard to make a long-term vision stick. The value of both, together, is hard to argue with; a great vision inspires your team with what’s possible, and a relentless drive spurs them to achieve or get out of the way. Successful business owners own their greatest successes — and their most humiliating failures. If you can’t admit when you’re at fault and prefer instead to pin the blame on a hapless subordinate, you might be in the wrong business. This is a tough one for many Type-A entrepreneurs. It’s tempting to believe that you have all the answers, particularly as you notch key wins and find yourself at the helm of a business that seems to have boundless reserves of momentum. If you don’t recognize that your wisdom has limits, and that you as a human being are fallible, you risk plowing headlong into a situation that you can’t control — and whose odds don’t favor you or your team. When you admit that you can’t do everything better than everyone else, you lift the burden of impossible expectations and remove a crucial bottleneck to growth — your own ego. Oh, yes, as a business owner, you need to know when to say “no” and mean it. Knowing when to say “no” isn’t just about marking your territory and making it clear that you’re in charge. It’s about recognizing and avoiding low-value demands on your time. By saying “no” to something that isn’t likely to benefit you or your team, or at least isn’t likely to create as much value as the alternative, you’re leaving the door open for a more productive — and profitable — use of your time. What’s your best entrepreneurial trait? You can follow Steve Voudouris here. You’re the Boss. Will They Listen? Congratulations! Your startup is getting off the ground. Prospects are calling, sales are rising, and real money is trickling through the door. If things keep up like this, you’re going to need to hire some people who actually know what they’re doing; driven as you are, you can’t possibly do everything necessary to keep your business running. You know what you need to do next, but what comes after that? What happens six or nine months into your new finance guy’s gig when you ask him to take the lead on some mission-critical project and he responds dismissively because he’s years older than you? What’s a young boss to do? In the beginning, this will happen as a matter of course. As one of the only people working for your company, you’ll necessarily interview each new candidate yourself. As your company grows, it’ll be easier to delegate recruiting to your emerging HR department, and they’ll hopefully do a great job. Don’t completely detach yourself from hiring, though. Take the time to personally vet candidates for each mission-critical role, especially those who’ll own entire processes or departments. Start building relationships during the interview and on-boarding phases, making sure that each candidate feels like a valued member of the team — and that you need their skills just as much as they need their jobs. You don’t want to come off like a clueless boss, but you also can’t afford to seem like a know-it-all — especially when you’re young enough to be your subordinates’ kid. When you bring someone new onboard, make sure they understand that you can’t do their job better than they can. Ask questions, invite them to tackle vexing problems, and give them space to manage their spheres as they see fit. You don’t have to come right out and tell your more mature underlings that “age is just a number and I’m the boss” to make the point loud and clear. From the beginning, make sure your subordinates understand that despite your lack of wrinkles and dearth of specialized knowledge in whatever process you’ve hired them to own, you have a legitimate claim to your own area of expertise: figuring out how to get things done. In other words, though the experience you accumulate as a real-world business owner is necessarily more diffuse than what you’d learn in law school or accounting class, it’s no less relevant to the work at hand. Remember, it’s essential to collaborate with these employees on equal footing, leveraging their expertise and drawing on your own hard-won experience whenever appropriate. It’s not always easy, but that’s why you’re the boss. Career track management is a double-edged sword. You need to provide ample professional development opportunities for employees up and down the ladder, particularly expert-level workers who can’t easily be replaced. Team members who feel like there’s no room to grow at your company won’t stick around to find out. Likewise, you need to recognize when a particular subordinate is no longer contributing to your company’s growth or goal-setting, and determine whether you’d be better off with or without them in the future. If it’s the latter, it’s your responsibility to coach them out of the organization.